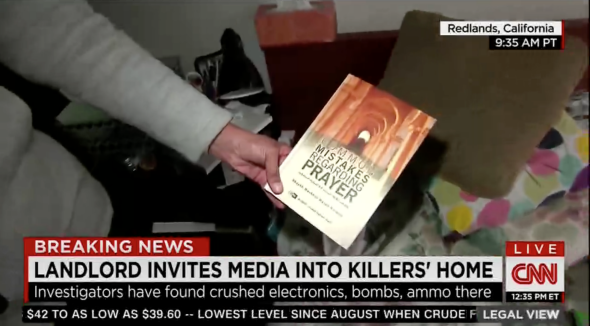 MSBNC, CNN descend on San Bernardino suspects' apartment live on TV. Television news networks showed their viewers a bizarre spectacle Friday afternoon: a tour of the San Bernardino, California, shooting suspects’ apartment. Was this responsible? Allowed? Good for the world? Airing coverage live when there might be, say, Social Security numbers and other personal information of family members on display makes me think no, maybe, and doubtful, in that order. But the landlord to Tashfeen Malik and Syed Farook opened up the apartment, and so camera crews rushed in. CBS: "Why did you let the cameras inside?" MSNBC got in on the action first. What’s that, a pink stuffed animal of some sort? Big catch. Turns out the apartment featured other toys. Hmm. They were Muslims … and had a Quran?!? Why not just blast a lot of very private information of someone or another onto live television? MSNBC examining woman’s photo in the bathroom >> "I’m going to guess that these are the photographs of Malik … But we don’t know." Andrea Mitchell was talking to Sen. Lindsey Graham during the breaking news. Graham was … confused. Lindsey Graham, on the phone w MSNBC, says he's "astonished" they're letting people go through the apt. "I've never seen anything like this"
It’s unclear how authorities feel about the TV news stampede. "Our search is over. We released the scene yesterday." -- Spokesperson for FBI LA, to me, moments ago. Take it for what it's worth. CNN, like many other news organizations, was granted access to the home by the landlord. We made a conscious editorial decision not to show close-up footage of any material that could be considered sensitive or identifiable, such as photos or ID cards.